Gifts made through estate planning or Planned Giving, represent the future of the Quincy Humane Society. Planned gifts help increase our endowment and ensure continuation and expansion of the Quincy Humane Society’s services and programs for generations to come. To avoid legal challenges and guarantee the Quincy Humane Society receives your gift or bequest, please be sure to use the following language for all planned gifts. 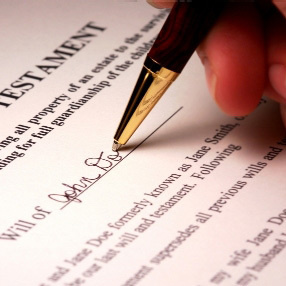 Revocable Living Trusts are not subject to probate. They remain private and avoid public scrutiny. When you die, a trust will save time, expense, publicity and frustration for those you love. Trusts also assure seamless administration of your assets at your death or in the event you become incapacitated. A Charitable Remainder Trust enables you to contribute to the Quincy Humane Society and receive guaranteed payments for life or a period of years through a trust designed by you with the help of your lawyer. Payments may either be a fixed amount or a fixed percentage of the trust assets. A Charitable Remainder Trust offers gift, estate and income tax benefits. Because you design this trust yourself, it is more versatile than a Charitable Gift Annuity. The reverse of a Charitable Remainder Trust, a Charitable Lead Trust will pay the Quincy Humane Society income during your life, someone else’s life, or for a fixed number of years. Your beneficiaries will receive the remainder. You will be able to design the trust to fit your particular needs. Charitable Lead Trust assets are not taxable in your estate when you die, thereby providing valuable income, gift and estate tax benefits. Charitable Gift Annuities You can contribute to the Quincy Humane Society of and receive guaranteed payments for the rest of your life or for the joint lives of you and your spouse or another individual. You will receive an income tax deduction when you make the gift and valuable tax benefits each year. Quincy Humane Society Charitable Gift Annuities are available for a minimum contribution of $10,000. Life Insurance Benefits from life insurance owned by you at the time of your death will be included in your estate. If you designate the Quincy Humane Society as the beneficiary, your estate will receive an estate tax deduction equal to the full amount of the insurance benefit. You can donate an existing policy and receive a tax deduction for the current value now. To avoid legal challenges and guarantee the Quincy Humane Society of receives your insurance benefit, please be sure to use the following language for your beneficiary designation. Real Estate No gift of real property shall be accepted without first being appraised and examined for potential liability under environmental impact laws. The Quincy Humane Society reserves the right to reject any gifts of real property. Bequests Real Estate may be donated to the Quincy Humane Society by providing specifically for it in your will. Real Estate donated to the Quincy Humane Society upon your death escapes estate taxation. Retained Life Interests You can donate your home or farm to the Quincy Humane Society while you are living, receive a tax deduction and retain the right to live in or use the property for the rest of your life. Personal Property You may provide for the bequest of personal property such as jewelry, collectibles or vehicles to the Quincy Humane Society in your estate plans. Special rules apply when making planned gifts of personal property, so please be sure to consult your attorney as well as the Quincy Humane Society before making such provisions. Retirement Benefits Assets in your 401(k), pension, IRA or other retirement plan will be subject to estate and income taxes when you die. They may also be subject to generation-skipping taxes. This double, or triple, taxation means your beneficiaries could potentially receive less than 20% of your retirement assets! If you name the Quincy Humane Society as the beneficiary, there will be no taxes. Other giving opportunities available through the Community Foundation Quincy Humane Society Fund, Betty J. Starnes Fund for the Quincy Humane Society and The Clifford H. Taylor Fund for the Quincy Humane Society.